Rudy is one of my favorite movies. It is a movie about a walk-on football player who spent his whole life dreaming of playing for the Fighting Irish of Notre Dame. He goes to a junior college across the way, gains admission to Notre Dame as a Junior and plays two years for Coaches Ara Parseghian and, his senior year, for Dan Devine. He dresses his last game, and to this day, is the only football player raised to the shoulders of his teammates and carted off the field at his final game’s conclusion. 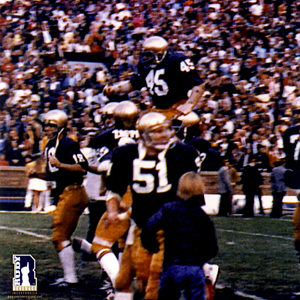 There is a poignant scene where Rudy Ruettiger, believing Devine is going back on a promise made by Parseghian to allow Rudy to dress and run out through the tunnel for his last game, decides he is quitting the football team. Rudy is approached by a former player, turned field maintenance man named Fortune, who tells him, You’re 5 foot nothin’, 100 and nothin’, and you have barely a speck of athletic ability. And you hung in there with the best college football players in the land for 2 years. And you’re gonna walk outta here with a degree from the University of Notre Dame. In this life, you don’t have to prove nothin’ to nobody but yourself. And after what you’ve gone through, if you haven’t done that by now, it ain’t gonna never happen. Now go on back. 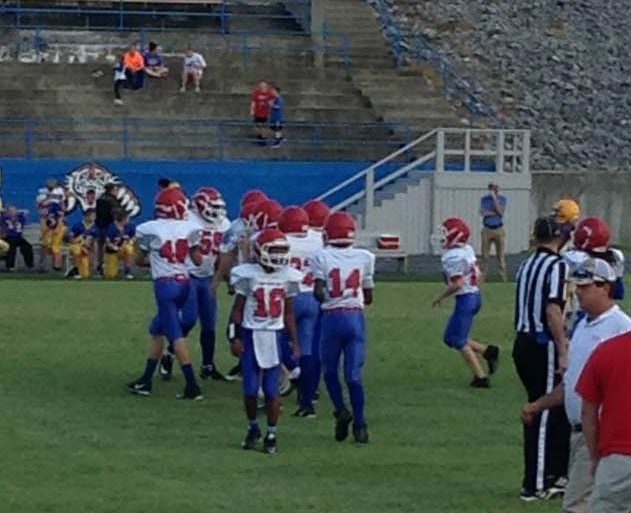 I thought of the 5 foot nothin’, 100 and nothin’ line last night as I watched a 6th grader at CCMS nearly lead his team down the field to tie, and possibly beat my 8th grade HMS squad that has only won 14 of its past 16 football games and is the defending Region I Champion and State Semi-finalist. We escaped with our lives last night, 12-6, by intercepting a Keith pass after the sixth grader had led his team down into our red zone to potentially send us home talking about what ifs. It was a stunning exhibition of poise, ability, and talent from a kid who has been exceedingly well coached, and a kid I will want no part of trying to beat when he is actually an enrolled Middle School student. I agree with our Defensive Coordinator, Carl Banks, the Keith kid is the real deal. Joshuah Keith may be short, but, after all, what 11 year old playing both with and against predominantly 14 year olds doesn’t look short? Like Russell Wilson, whose quote about himself I am applying to Joshuah Keith, Joshuah’s height doesn’t define [his] skill set. To be a great quarterback, you have to have great leadership, great attention to detail and a relentless competitive nature… From my perspective, check, check, and check. We rushed that kid, we blitzed that kid, We sent our over six foot tall ends at the kid instructing them to get their hands high up in the air, maybe he will misfire. 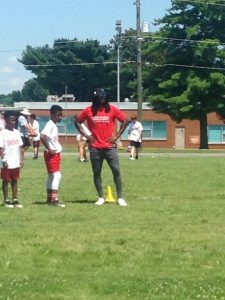 Joshuah, who attended the Andre Roberts Pro-Camp this year, and who is the son of Coach Darrel Keith, himself formerly the HC of the Colonels at CCMS and now on the HS, CCHS, coaching staff, does everything well. He makes his drops well, sets his feet well, stands tall (as he can) to deliver the ball well and gets the ball out quickly and from the appropriate slot. He murdered us in the 7th grade game, noteworthy for a sixth grader standing alone, and then nearly led his team to victory in the 8th grade contest to boot. I almost found myself cheering for him, but…not quite. Legendary Coach Woody Hayes once said…The five big mistakes in football are the fumble, the interception, the penalty, the badly called play, the blocked punt-and most of these originate with the quarterback. Find a mistake-proof quarterback and you have this game won. From my vantage point on the HMS sideline, Joshuah may have made just one mistake all night, the last pass thrown into the end zone which we picked, and that really was more a case of our making a play than he making a mistake. Otherwise, he just nearly had that game won. 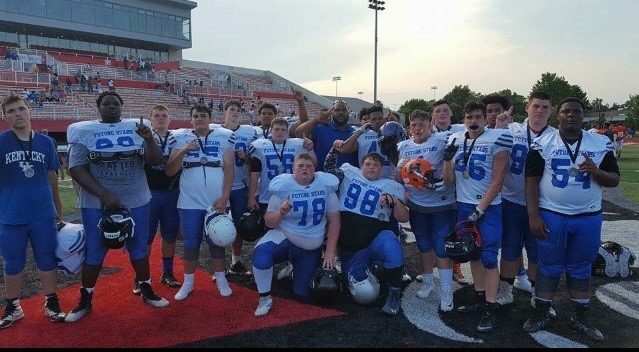 Winning an 8th grade game against an 8th grade team which has met with as much recent success as HMS, would have been a truly monumental achievement. As it was, young Keith, if last night’s performance didn’t enforce for you that…In this life, you don’t have to prove nothin’ to nobody but yourself. And after what you’ve gone through, if you haven’t done that by now, it ain’t gonna never happen, then I just don’t know what to tell you. What a football player! This is Fletcher Long reporting for Kentucky Prep Gridiron reminding you to PLAY THROUGH THE WHISTLE!